Assembling the Hesco Bastion entails unfolding it and (if available) using a front end loader to fill it with sand, dirt or gravel. The placement of the barrier is generally very similar to the placement of a sandbag barrier or earth berm except that room must generally be allowed for the equipment used to fill the barrier. The main advantage of Hesco Barrier, strongly contributing to their popularity with troops and flood fighters, is the quick and easy setup. Previously, people had to fill sandbags, a slow undertaking,Welded Gabion Box, with one worker filling about 20 sandbags per hour. Workers using Hesco Barrier and a front end loader can do ten times the work of those using sandbags. 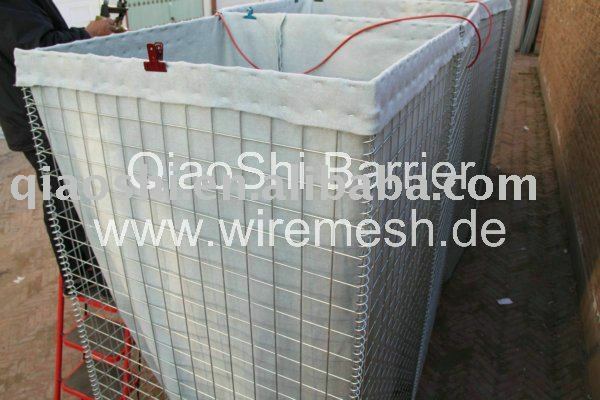 Material: It is made of galvanized welded mesh, spring with other fittings, can be filled with sand, earth, cement, stone. Can be used in separate cell or some cells joint together. Geotextile:in heavy duty non-woven polypropylene. The HESCO barrier or HESCO bastion is a modern gabion used for flood control and military fortification. is made of a collapsible wire mesh container and heavy duty fabric liner,t post, and used as a temporary to semi-permanent dike or barrier against blast or small-arms.